Red's Shoe Diaries: What is that, velvet? I have worn this Land's End wrap skirt six ways from Sunday but, until this Fall, it never occurred to me to pair it with this paprika velvet blazer that wasn't getting enough love at the back of my closet. When I reached for it, I couldn't help but think of the iconic line from Saul in Coming to America. 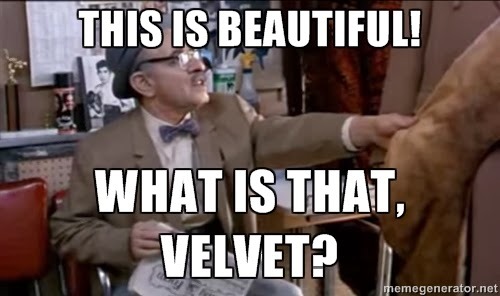 It's no wonder because every time my husband gets within six feet of velvet fabric, he feels compelled to quote said line in his best "Saul, the barber" voice. Even though I know it's coming, it makes me laugh every time. Like I said, I can't get enough of this plaid skirt that I thrifted for $6 - talk about return on investment! This season alone, I've also paired it with the oldest, never before-worn item in my closet (see prior post, here); with an on-trend faux leather moto vest in unexpected olive green; with a cowl neck sweater and favorite belt; and with a puffy, quilted hunting jacket, below. And I'm not done mixing and matching it with other pieces I already own! I've concluded that a multi-hued plaid is the perfect pattern to mix and match in a multitude of ways. I've also concluded that I have a borderline ridiculous amount of orange and green in my closet. Oh well - wear what makes you happy! I love the plaid skirt and how you styled it! Great colors on you! Thanks for sharing your look with Three-fer Thursday! Not just for Baby Brothers and Batman!